No fire trucks are coming, so the fire signal gives Ellsworth Street traffic the green light. This, in case you can’t tell, is the intersection of Ellsworth Street and Sixth Avenue in Albany. It’s also the scene of what is shaping up as a big waste of public money. See those fire signals up there? They tell traffic on Ellsworth that it’s OK to keep going across Sixth. When, on the other hand, fire trucks come barreling along on Sixth from the main fire station one block away on Lyon, the lights turn red. Works great. But now, city officials say, they have been told by ODOT that those lights and posts no longer meet standards and must be replaced when the sidewalks get a new “streetscape” treatment later this year. 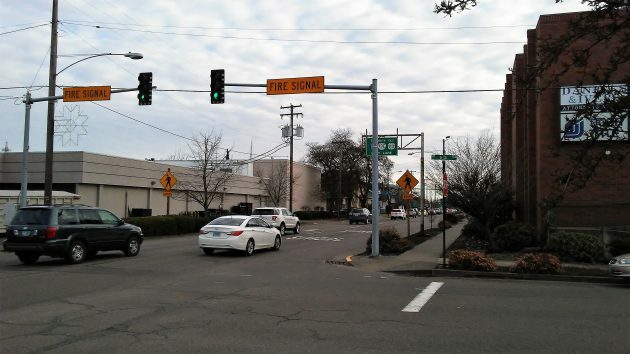 “ODOT has indicated to staff that when the curbs are modified with the downtown streetscape project, the existing poles and mast arms will need to be removed and upgraded,” City Engineer Staci Belcastro wrote in a memo to the downtown urban renewal board last week. On Monday the city council got the same message. One alternative is a “sign bridge” equipped with flashing yellow lights. The estimate for this runs around $200,000. This would be money down the drain because flashing yellow lights don’t stop traffic. For that reason, the fire department would prefer a traffic signal there, one that would be activated when trucks respond to an alarm, as now. The cost of that would be greater yet. Actually, the fire department would be happy just to leave things as they are. But ODOT, as I understand it, does not like the present signal because while it stops Ellsworth traffic when activated, eastbound drivers on Sixth see no signal at all and might pull right into a fire engine turning left on Ellsworth. Evidently somebody forgot that drivers facing east on Sixth would look straight into a fire truck screaming their way with lights and sirens. If they can ignore that, a red signal won’t stop them. ODOT really needs a waiver system that works swiftly and sensibly. Cities know what works locally, and ought to have it. This new regulatory regime under Trump promised to remove, repeal, replace or repel “at least 75% of regulations.” That is obviously not happening quickly enough and ODOT seems not to be on board. Many have expressed doubt as to the veracity of that reckless 75% reduction claim. Continuing down the philosophical tunnel, the current administration has indicated, on more than one occasion, that it would prefer to turn whatever’s left of the regulatory burden over to the states. Many on the conservative spectrum champion this power shift to state authority because the state is “closer” to it’s citizens and knows best how to spend monies effectively. We already have several states where local control types want to limit voting access, making America great again for certain people. However, in this instance, Mr. Hering is not content with feel-good state-level control. He seems to suggest that the status quo is sufficient, that the current regulatory regime does the job perfectly well. But that set of rules emanates from ODOT, one of the very same State agencies deemed “closer” to the people. Perhaps we, the people, could hold a plebiscite on this and every issue. The ultimate in “local control” featuring ballot measures and referenda galore at each election cycle, giving the Voters Pamphlet and the actual ballot real heft. We did it with weed. Why not semaphores as well? That way, when things inevitably turn south, we will have only ourselves to blame. Local control…the very same control that brought us Jim Crow and the anti-Chinese and anti-Black chapters in Oregon’s early Constitution. It reads like a chapter out of Atlas Shrugged. Sounds like karma to me. The city put me through the ringer and forced me to put an asphalt handicap spot in my gravel lot, even though we didnt have customers. This was when Les Schwab still had their handicap parking spot in the far corner of their parking lot. Sounds like we need a name and email of the engineer in charge of this project to be posted. How many times have you travelled down Ellsworth, heard a siren, looked for the source, check the light – still green – and suddenly a fire department vehicle comes tearing out onto Ellsworth – the light for Ellsworth is still green. Is this signal activated automatically or is it done manually? We badly need a populist government in Salem and in our own City Hall chambers to save our property and income taxes from going even further out of control. Populism? Sure. The Sanders’ Democratic Socialism style a la Social Security but certainly not the Trump Fascist form. Once Donnie (the Prevaricator) Trump hears of this semaphore challenge facing the citizens of Albany, he may well decide to do some investigating of this troubling situation as he has promised to do after alleging massive voter fraud and disturbing Chicago murder rates. It is good to know that Trump is watching out for America. Her’s an idea: how about just telling ODOT additional signaling is not needed and any expenditures in doing so would be an “unfunded mandate” regulated by state law. Therefore if there is any additional expense involved they would have to pay for it.